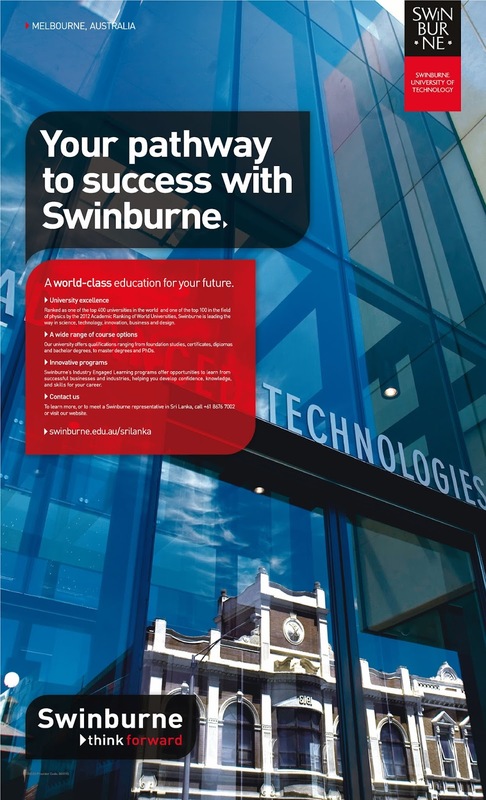 A word-class education for your future form Swinburne University of Technology for Sri Lankan . Ranked as one of the top 400 universities in the world and one of the top 100 in the field of physics by the 2012 Academic Ranking of World Universities, Swinburne is Leading the way in science, technology, innovation, business and design. and bachelor degrees, to master degrees and PhDs. Swinburne’s Industry Engaged Learning programs offer opportunities to learn from successful businesses and industries, helping you develop confidence, knowledge, and skills for your career. To [earn more, or to meet a Swinburne representative in Sri Lanka, caLl +61 8676 7002 or visit our website.